-21+ days prior to departure is based on the departing city time zone, not the booking city time zone. “RUMOR: Etihad to join Star Alliance, leave American partnership. As early as the end of March. Multiple sources leaking this info, seems semi-solid at this point. A lot of ramifications obviously but I expect the larger blogs to pick this up by the morning. 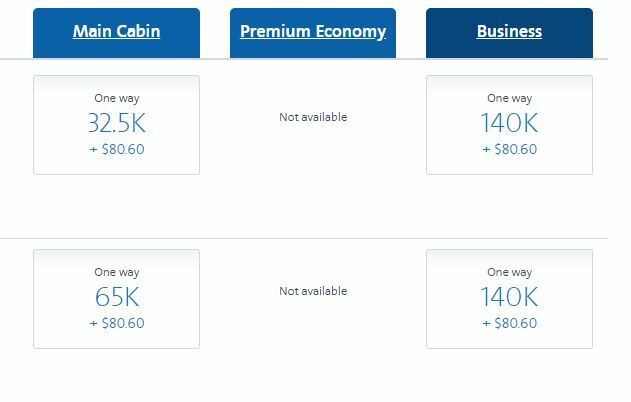 - Expect availability to disappear tomorrow/Monday or Etihad to immediately cut off AA bookings. 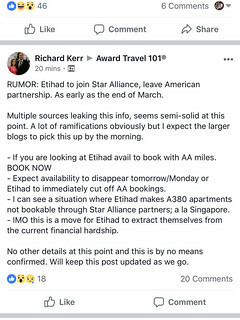 - I can see a situation where Etihad makes A380 apartments not bookable through Star Alliance partners; a la Singapore. - IMO this is a move for Etihad to extract themselves from the current financial hardship. In their hardships ending this relationship will do little help, and joining *A will only add to the financial burden. Seems like either just a rumor, or a not well thought out plan, scraping the bottom. Noticed that as well. ORD-MSP: 65k OW. A bargain! You're correct. I didn't realize the web special was anything different than a discount on sAAver.